Strategy creates context for operating decisions. It establishes the playing field and provides guidance for decision-making, the experience and skills needed by employees, positioning of marketing and advertising, the priority of initiatives, how to structure the company, and a many other issues. A plan is necessary to guide decision-making, channel resources, set goals and define direction. Strategy is a set of choices that defines the nature, direction and value system of an organisation. It is a mind-set which should be understood by every person in the organisation and used to guide all decision-making. What are our core values and beliefs? What markets and customer groups will we serve? What products and services will we offer and how profitable is each one? What infrastructure, core processes and resources must we have to succeed? What competitive advantages will cause us to succeed? What core competencies must we have to fuel our growth? How will we sell our products and services? How will we market our products and services? What financial results will we achieve? In this A to Z we will cover some of the main elements of business strategy and give you some tricks and tips along the way! Market penetration – This involves increasing market share within existing market segments. This can be achieved by selling more products/services to established customers or by finding new customers within existing markets. Product development – This involves developing new products and services for existing markets. Product development involves thinking about how new products can meet customer needs more closely and outperform those of your competitors. 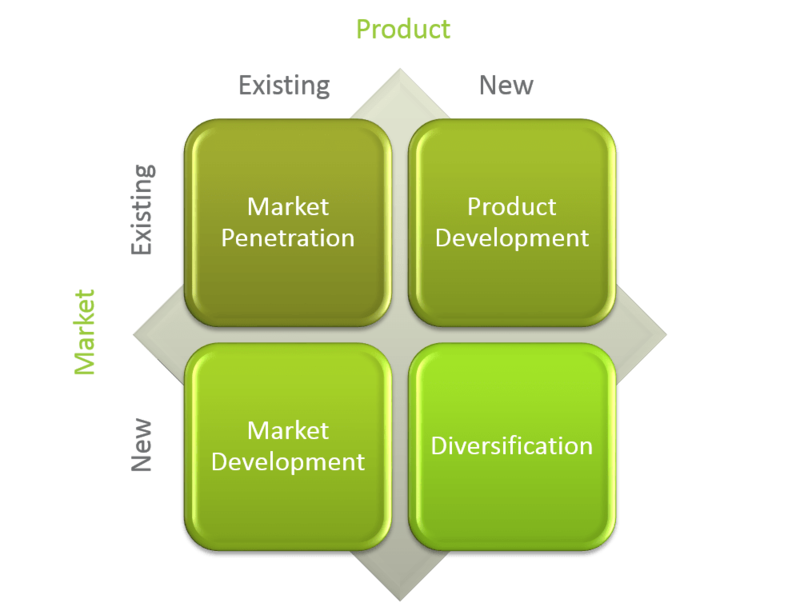 Market development – Finding new markets for existing products. Market research and further segmentation of markets helps to identify new groups of customers. Diversification – Moving new products into new markets at the same time. It is the most risky strategy. The more an organisation moves away from what it has done in the past the more uncertainties are created. However, if existing activities are threatened, diversification helps to spread risk. Financial perspective To succeed financially, how should we appear to our shareholders? Customer perspective To achieve our vision, how should we appear to our customers? Internal business processes To satisfy our shareholders and customers, what business processes must we excel at? Learning and growth To achieve our vision, how will we sustain our ability to change and improve? Crucial to any business strategy is an understanding of your costs, capital and most importantly, cash-flow. You must put plans and controls in place to ensure that you can maintain and grow profitability. Every company seeking profitable, sustainable growth must have a sound cost structure and strong cash-flow. In the long-term, it is essential for any competitive business to stay competitive through achieving continuous cost reductions that enable costs to reach a level that is below the average of its competitors. It isn’t necessary to become the lowest cost provider, but it is necessary to be one of the lower-cost suppliers. True profitability comes when a company is able to continuously reduce costs of producing and supplying products and services, even adjusting for inflation and other economic effects. The business that can be a lower cost producer has an advantage that provides flexibility in responding to other competitive pressures and actions. The best strategy in the world is useless if it is not delivered. For most organisations, achieving their strategic objectives requires a significant level of change and development through projects – technology, business integration, delivering new products and developing innovative approaches to customer management and service. Increasingly, the ability to properly initiate and execute these projects is a critical competitive advantage – or survival strategy. It can mean the difference between success and failure. Often the problem is not the projects themselves, but that there are simply too many independent and competing activities occurring simultaneously, without enough coordination or measurement. Initiative overload is the symptom of some common root causes, many of which have been exacerbated by the rate of change and degree of uncertainty experienced in recent years. Ensure that before execution of your strategy that you have prioritised and agreed your projects across your management teams, that you have a detailed plan and owner for each project and that you monitor these projects regularly to ensure you keep on track. A key part of any business strategy is a detailed forecast of what revenues and margins the business will be building over the term of the plan and thus the profits you will be making. The best business strategies model a number of financial scenarios based upon fixed assumptions and variable sensitivities, so that you can start to build best, worst and likely outcomes. Once you have an understanding of these you can start to build contingency plans within your strategy to mitigate risk. Supplier Power: Here you assess how easy it is for suppliers to drive up prices. This is driven by the number of suppliers of each key input, the uniqueness of their product or service, their strength and control over you, the cost of switching from one to another, and so on. The fewer the supplier choices you have, and the more you need suppliers’ help, the more powerful your suppliers are. Buyer Power: Here you ask yourself how easy it is for buyers to drive prices down. Again, this is driven by the number of buyers, the importance of each individual buyer to your business, the cost to them of switching from your products and services to those of someone else, and so on. If you deal with few, powerful buyers, then they are often able to dictate terms to you. Competitive Rivalry: What is important here is the number and capability of your competitors. If you have many competitors, and they offer equally attractive products and services, then you’ll most likely have little power in the situation, because suppliers and buyers will go elsewhere if they don’t get a good deal from you. On the other hand, if no-one else can do what you do, then you can often have tremendous strength. Threat of Substitution: This is affected by the ability of your customers to find a different way of doing what you do – for example, if you supply a unique software product that automates an important process, people may substitute by doing the process manually or by outsourcing it. If substitution is easy and substitution is viable, then this weakens your power. Threat of New Entry: Power is also affected by the ability of people to enter your market. If it costs little in time or money to enter your market and compete effectively, if there are few economies of scale in place, or if you have little protection for your key technologies, then new competitors can quickly enter your market and weaken your position. If you have strong and durable barriers to entry, then you can preserve a favorable position and take fair advantage of it. What goals do you have for your business? What do you want to achieve? By setting goals you establish where you intend to go and help you know when you’ve got there. They help improve your overall effectiveness as a company — whether you want to increase your share of the market, for example, or improve your customer service. The more carefully you define your goals, the more likely you are to do the right things and achieve what you wanted to accomplish in the first place. Select no more than five goals that you think are absolutely, positively essential to your business success. If you come up with only four, even better. If you can’t get away with fewer than six or seven, that’s okay, too. Just be sure you establish a list of goals long enough to drive your success, but don’t overwhelm your ability to focus on each one. After you decide on your list, fine-tune each goal, using these guidelines: Keep each goal clear and simple. Be specific. Be realistic. Don’t be afraid to push yourself. Make sure that your goals are in sync with your mission. It is also useful to prioritise your goals in order of importance if you can. When there is a clash of resource in the future, having an agreed priority of your goals, will often help you decide where you need to invest. I’m not talking about the function / department of Human Resources here. I’m talking about what people resources will you require to meet your business strategy. There are four basic ways to influence employee attributes, competencies, and goals: hire the right people, focus them on the right things, ensure they are doing things the right way and foster the right development. Hire the right people in the first place- Staff positions with employees whose personal attributes match the competencies and goals associated with their jobs. This is the primary focus of recruiting, workforce planning, and certain aspects of succession management. Focus employees on the right things – Clearly identify and communicate the goals you want employees to achieve, and measure and reward employees against these goals. This is the focus of goal management. Make sure people are doing their job the right way – Define the competencies employees must display to achieve their job goals or support the desired company culture, and provide feedback and other resources that encourage them to demonstrate these competencies. This is usually the primary focus of performance management. Provide job experiences and resources that drive the right development – Create a work environment that helps employees develop the attributes that influence competency performance and goal accomplishment. Put people in jobs and assign them goals so they acquire experiences and other attributes needed for future job roles. This is the primary focus of career development and certain aspects of succession management. Sometimes, even after coaching and support, employees do not meet the performances levels for a particular role or the role simply needs to change for the good of your business. It might be that their skills are better suited elsewhere in your organisation or it may better for both parties that they move on to a role elsewhere. In order to achieve your strategic goals and objectives (see O) you may need to set up some focussed projects to ensure that your objectives and ultimately your goals are met. Initiatives may span more than one Objective, but more often than not, they are defined concrete list of projects that must be completed to move you forward. They key to driving Initiatives through is ownership and accountability. Ensure that each initiative is owned by one individual that is accountable for delivery and they are tasked with closely managing the initiatives and that they report back regularly on progress. What do I mean by Jewel in the Crown? What makes your product or service unique – Your Unique Selling Point (USP)? For Rackspace it would be their customer service or more precisely their Fanatical Support model. For Amazon it used to be Earth’s Biggest Bookstore, but now could it be their Prime Service, the Kindle or more likely the buying and delivery experience. What do we do the best? What do we do better than our competition? What awards have we won? What have our customers said about us? What praise do we often get from our customers? What endorsements from celebrities or well know organisations do we have? What endorsements could we get? How is our business model different from our competition? How could it be different? What market category or niche is not being served by our industry? It is also imperative to interview and survey your current and past customers. Ask them why they bought from you rather than your competition? What are they looking for in a provider of your product or service? What is important to them when making a buying decision? What feature or benefits do they value most or would like to see added to your product or service? Once you’ve identified your Crown Jewels – Protect them at all costs! 3.) Stimulates cultural change and innovation. Having terabytes of data whizzing around your organisation is all well and good, but how much of it is used, useful and relevant? Investing in systems, processes and people to ensure your leaders, managers, employees and partners have the best views and analysis of information is crucial, not just for your strategy planning, but for use everyday to make swift and enlightened decisions to resolve issues, win new business, launch new services or products and maintain or reduce costs. If you don’t already have knowledge management at the heart of your business, you really should think about investing in the right people and tools as soon as possible. Learning and Development should be a key part of your business strategy, even if you’re a sole trader. What do you and your people need in order to develop and be better next year than you or they were this year? Yes, technical qualifications may be the answer for some, but also what about some of the softer skills and improved on the job training? For a business to be competitive, it is important that it has the right number of people with the right skills in the right jobs. Workforce planning enables a business to audit its current staff numbers and the skills they have in place as well as identify where it has skills gaps needed to meet its business objectives. What competencies (and behaviours) do you need in your business for the future? Have you got the correct mix today or the right raw materials to work with? The goal of a market analysis is to determine the attractiveness of a market, both now and in the future. Organisations use the finding to guide the investment decisions they make to advance their success. The findings of a market analysis may motivate an organisation to change various aspects of its investment strategy. Affected areas may include inventory levels, a work force expansion/contraction, facility expansion, purchases of capital equipment, and promotional activities. Objectives are the specific steps you and your company need to take in order to reach each of your goals. They specify what you must do — and when. Goals tell you where you want to go – Objectives tell you exactly how to get there. Goals can increase your effectiveness – Objectives back your goals and make you more efficient. Goals are typically described in words – Objectives often come with numbers and specific dates. PESTLE stands for – Political, Economic, Sociological, Technological, Legal, Environmental. A PESTLE analysis is a useful tool for understanding the ‘big picture’ of the environment in which an organisation is operating. Specifically a PESTLE analysis is a useful tool for understanding risks associated with market (the need for a product or service) growth or decline, and as such the position, potential and direction for an individual business or organisation. A PESTLE analysis is often used as a generic ‘orientation’ tool, finding out where an organisation or product is in the context of what is happening outside that will at some point affect what is happening inside an organisation. The six elements form a framework for reviewing a situation, and can also be used to review a strategy or position, direction of a company, a marketing proposition, or idea. The implementation of Quality Management systems is shown to dramatically improve the performance of organisations. Depending upon your organisation type, you may or may not have to comply with quality or legal standards before you can even start trading, but for many organisations it is a conscious strategic decision to implement a Quality management System or strive for accreditation to National or International standards pertinent to their industry or segment. There are many Quality Management methodologies in wide use today. Despite the differences in these methodologies, each has the ultimate goal of improving performance and quality and customer experience. A piece of advice before you embark on any quality management implementation would be to ensure that your key people are bought into what you are trying to achieve with quality processes and procedures and why they’re important for you, for them and your customers. Gaining quality accreditations should not just be about getting a certificate on your wall! Do you have the strength of skills within your team to achieve your strategic targets and business objectives? Do you have plans in place to ensure the continuation of your operations should disaster strike? Do you have the knowledge and metrics available to support your strategic and operative decision-making and planning? Are you agile enough as an organisation to take advantage of risks when they arise? Could you improve your organisational risk awareness, learning and resilience? Do you comply with legal and regulatory requirements and international standards? Do you have the appropriate level of organisational governance and controls in place? Have you minimised the negative effects of the risks on your operations? What risks face your organisation and what are their levels of impact and probability? What are you doing to mitigate against them? How will you promote your business? How will you get your product or service to your customers? What are the costs to promote and distribute your products or services? How you will measure the effectiveness of the methods you plan to use? What is your Brand strategy? You need to answer these questions within a well-defined Sales and Marketing plan. Notice that I’ve said ‘Sales & Marketing’ Plan. Not a separate sales plan and a separate marketing plan. Now you might end up with separate operational plans for your sales and marketing functions, but strategically it is HUGELY important that they are joined up at the outset. I’ve lost count of the number of times I’ve seen and heard of sales and marketing teams that don’t even communicate regularly to each other, never mind share the same focus and strategy. I would say it’s one of the big failures in medium to large enterprises, especially technology businesses. Areas of this A to Z I would expect to see with the Sales & Marketing Plan would be letters: A, F, M, N, P, T, U, V and W.
Whatever your line(s) of business, whatever segment of the market whether in the public, private or voluntary sectors, you need to understand your customers – old, new and prospective customers. You might want to think about the answers to some of these questions: Who are they? Where are they? What are they buying and why? How much do they spend with you each year? How much do they have to spend? How much are they spending with your competitors? How do they like to buy? What do they think of you? When did they buy from you last and when are they likely to buy again? When did you last speak with them? I could go on… If you can’t answer any of these questions, then you have some work to do! Which of the above really motivated you and gave you energy?….If it was one or both of the last two, then it’s time you found another blog to read. A key ingredient to the foundation of any business strategy is the ‘Why?’ – Why does your company exist? Why would customers buy from you and not your competitor? Why would someone want to work in your organisation? Why would someone keep coming back to buy from you? Tough questions, but get to the bottom of these and you’re on the way to understanding the foundations of your strategy. In my experience, in organisations I’ve worked for or worked with, there are always X Men and X Women. I’m not talking about the film characters, but I am talking about superheroes. Who are your ‘X’ people – your top performers, at all levels of your organisation? To effectively communicate to, engage with and motivate your organisation around your strategy AND deliver it, you’re going to need them. Keep these people motivated, well-rewarded and informed, and they’ll do much of the hard work for you in driving your organisation forward. Do the opposite and at best you’ll lose them, at worst you could create an group of disengaged, disenfranchised and vocal opponents who have great influence in your organisation. Revenues & expenses are independent of cash payments. Recognise them when a transaction happens, not when cash comes in or goes out (maybe much later). Cost of Goods Sold are the direct costs in producing your service – materials, installation costs, customer service, maintenance, etc. Depreciation expense spreads out the cost of property, plant and equipment – over its useful life. The larger your organisation, the more important this last element is. You may have multiple departments within your organisation, but you should only have a single direction and ultimate vision that all departments are striving towards. When pulling your business strategy together it is important that each department head understands their remit completely and more importantly both how their department contributes to the organisation’s vision and their interactions with other departments. I have seen so many times in my career, even in global businesses, where there is little alignment at senior management level as to where the business is going and the part they have to play in it. Do not allow your strategy to be built in silo’s. Department heads, absolutely should be talking to each other and aligning their activities, priorities, budgets, resources and roadmaps so that everyone in your organisation understands what their priorities are, what they’re to focus on and how they’re going to achieve their goals, objectives and ultimately the business strategy. I hope you enjoyed this A to Z and that it gave you some food for thought. Don’t forget that Oak Consult are specialists in helping organisations develop their strategies. We’d be delighted to talk to you should you need some support! Until next time….